During the course of a year, MCHS provides community members and businesses with opportunities to become sponsors of our organization and programs. If you are interested in becoming a sponsor, please print off one of the registration forms below and mail it back to us with your sponsorship. If you have any questions about how the sponsorship money is spent, feel free to contact John. Event & Program Sponsors are available to individuals and businesses who wish to help out with expenses associated with traveling exhibits, programs, and special events. In 2003, MCHS completed work on the Ag Building and opened it in time for the Mower County Fair that year. This building houses a collection of artifacts from the early years of farming up to the present. During Fair Week, the building hosts an Antique Tractor Show that attracts people from all over the area. 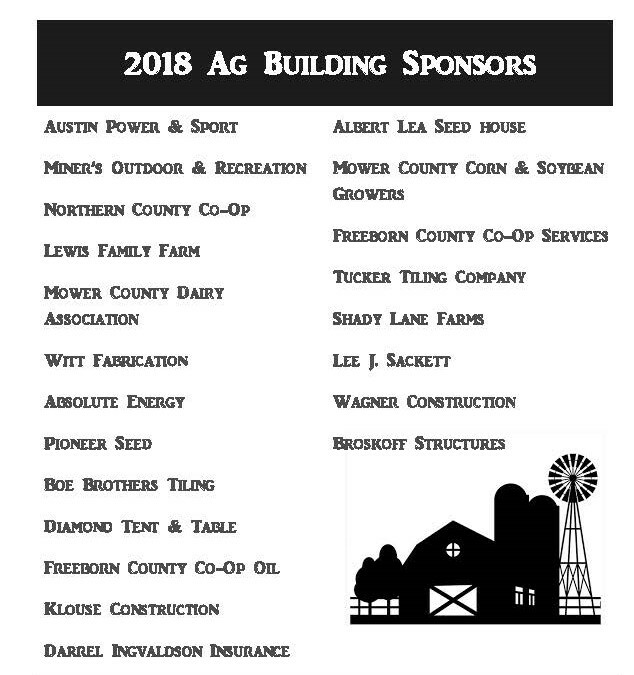 As an Ag Building Sponsor, businesses are allowed to display a 4'x4' sign in the building for one full year. Sponsorship costs $250 per year.